responsible for Fernando García's "forced disappearance"
Washington, D.C., February 18, 2011 - Twenty-seven years ago today, Guatemalan labor activist Edgar Fernando García was shot and kidnapped by government security forces off a street in downtown Guatemala City. He was never seen again. In recognition of the anniversary of his disappearance, the National Security Archive today posts the complete text of the historic ruling issued last October by a Guatemalan court that convicted two former policemen to 40 years in prison for the crime, as well as key documents from the Guatemalan National Police Archive that were used in the prosecution. Fernando García's family continues to fight for justice inside Guatemala and internationally. The groundbreaking trial that found Héctor Roderico Ramírez Ríos and Abraham Lancerio Gómez – both low-ranking police agents at the time of the abduction – guilty of García's "forced disappearance" ended with the court's unprecedented order that the government investigate their superior officers. Meanwhile in Washington, where the García case has been pending before the Inter-American Human Rights Commission for over a decade, the commission announced on February 9 its decision to send the case to the Inter-American Court in Costa Rica due to Guatemala's failure to act on commission findings. The Fernando García trial took place over several days last October in a crowded courtroom in the "Tribunals Tower" in downtown Guatemala City, and brought together an extraordinary array of experts and witnesses testifying on behalf of the prosecution. (To see a more complete description of the first days of the trial, see Kate Doyle's blog posting.) 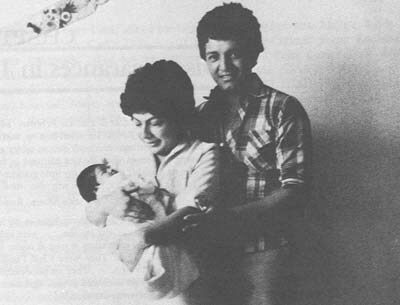 Congresswomen Nineth Montenegro, García's wife and mother of their infant daughter, Alejandra, at the time of his abduction, told the court about her anguished search for her husband in the months following his disappearance, leading to the creation of one of Guatemala's first human rights organizations, the Mutual Support Group (GAM). Alejandra García Montenegro, now a lawyer who served as the querellante adhesivo or "private prosecutor" in the case, spoke movingly at the trial's end about the impact of his disappearance on her family and her own childhood. García's elderly mother also testified, expressing the pain she has endured for almost three decades in losing her son without knowing his ultimate fate. At the heart of the prosecution's case were the official records of the former National Police of Guatemala, recovered by the Office of the Human Rights Prosecutor in 2005 and now being examined for evidence of human right crimes. Velia Muralles Bautista, an investigator with the Historic Archives of the National Police (AHPN), gave expert testimony on hundreds of police records connected to the February 1984 counterinsurgency operation that resulted in Fernando García's abduction. Muralles drew particular attention to a handful of key documents that contained powerful evidence of the Guatemalan government's role in planning and carrying out García's capture. They included records of the police Joint Operations Center (Centro de Operaciones Conjuntas, or COC), which controlled and commanded the police units involved in the operation [documents 3, 4, 5, and 6]; a hand-drawn map of Guatemala City, assigning Zone 11— where García and his companion, Danilo Chinchilla, were captured — to the Fourth Corps of the National Police [document 7]; and the recommendation from the National Police hierarchy that the defendants be considered for medals for their heroic actions in the counterinsurgency operation on that day, at the time, and in the place of the capture of Edgar [document 2]. On the last days of the trial, Marco Tulio Alvarez, head of Guatemala's Archivos de la Paz (Archives of Peace), testified on the political and historical context of Fernando García's disappearance. His testimony addressed the coordination between government agencies in "cleansing operations", specifically between the military and the National Police. In his testimony, Tulio Alvarez referred to documents from the AHPN, the Death Squad Diary, and declassified U.S. documents obtained by the National Security Archive, among other Guatemalan government documents. Tulio Alvarez used this documentary evidence to paint a picture for the court of government repression of those who spoke against the government, groups the Guatemalan government considered "internal enemies." His testimony touched on the regime's desire to "annihilate local secret communities, and military units…" which was described in a military document, Plan Victoria 82. For a more detailed account of the last days of the trial and other witnesses, see the report written by C. Carolina López, our associate in Guatemala. Now, the pressure is on the Guatemalan government, not only from the ruling of the three judges in Guatemala who heard this case, but also the pending hearing before the Inter-American Court in Costa Rica. An indictment and trial of superior officers allegedly responsible for ordering the cleansing operations would truly be a landmark development for human rights justice in Guatemala. This document is the official ruling of the Guatemalan court, which convicted former National Police officers Héctor Roderico Ramírez Ríos and Abraham Lancerio Gómez of forced disappearance in the case of Edgar Fernando García. The two men received the maximum sentence of 40 years in prison. The ruling, written by three Guatemala judges, acknowledges that Edgar Fernando García was illegally detained; the disappearance was committed by state security agents within national security policy; and the crime was against the individual liberties and freedoms of Fernando García. The official ruling also includes parts of the testimony from eye witnesses, as well as expert witness testimony on the documents from the Historical Archive of the National Police (AHPN) and the declassified U.S. government documents from the National Security Archive collections. This documents records the nomination of four police officers, Hector Roderico Ramírez Ríos, Alfonso Guillermo de Leon, Hugo Rolando Gomez Osorio, and Abraham Lancerio Gómez to receive awards for their actions on February 18, 1984 at 11:00 in the morning with their encounter with "two subversives" who had subversive propaganda and fire arms at the "Mercado de Guarda" in zone 11. This was the exact date, time, and place that Fernando García and his companion Danilo Chinchilla were abducted. 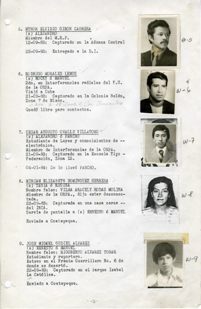 In her testimony, expert witness Velia Muralles used this document to demonstrate that these four former National Police officers took part in the crime of the forced disappearance of Fernando García because of the awards they received for participating in the cleansing operation the morning he was shot and disappeared. Oficio COC - 165 - WA, Guatemala. Oficio COC - 173 - WA, Guatemala. These four documents (three through six) are from the "Centro de Operaciones Conjuntas" or COC, which was the "Center of Cooperative Operations" between the military and the police. These documents are from February 1984, days before Fernando García was disappeared. Expert witness Muralles explained that this document showed the coordination between the military and police in the overall national strategy of "cleansing operations" or "operación limpieza." Document 6, from February 17, 1984 shows detailed instructions from COC Chief, Monico Antonio Cano Perez for a member of the National Police to carry out an operation on the morning of February 18, between 9:00am and 12:00pm, the exact window during which Fernando García was abducted. This is another document from Joint Operations Center giving instructions to the National Police regarding cleansing operations. This documents contains two pages that show which sectors of the city were assigned to specific corps of the National Police. The second to last page, titled "Sectores de la Ciudad Capital para Operaciones Limpieza de los Cuerpos P.N." shows that the Fourth Corps was in charge of Zone 11 for the patrol for "operacion limpieza". The defendents, Héctor Roderico Ramírez Ríos and Abraham Lancerio Gómez, were members of the fourth corps. The last page, titled "Croquis Demostrativo Sectores Ciudad Capital Para Operacion Limpeza de los Cuerpos P.N." is a hand-drawn map shows a yellow-gold outline for Zone 11, where Fernando García was captured. This document is a logbook list of which units were assigned to patrol which areas on certain days. We see that the Fourth Corps of the National Police was assigned to patrol Zones 11 and 12 during the hours of 9:00am and 12:00pm on Feburary 18, 1984. The defendents, Héctor Roderico Ramírez Ríos and Abraham Lancerio Gómez, were members of the fourth corps.